Write, perform and promote your own songs! 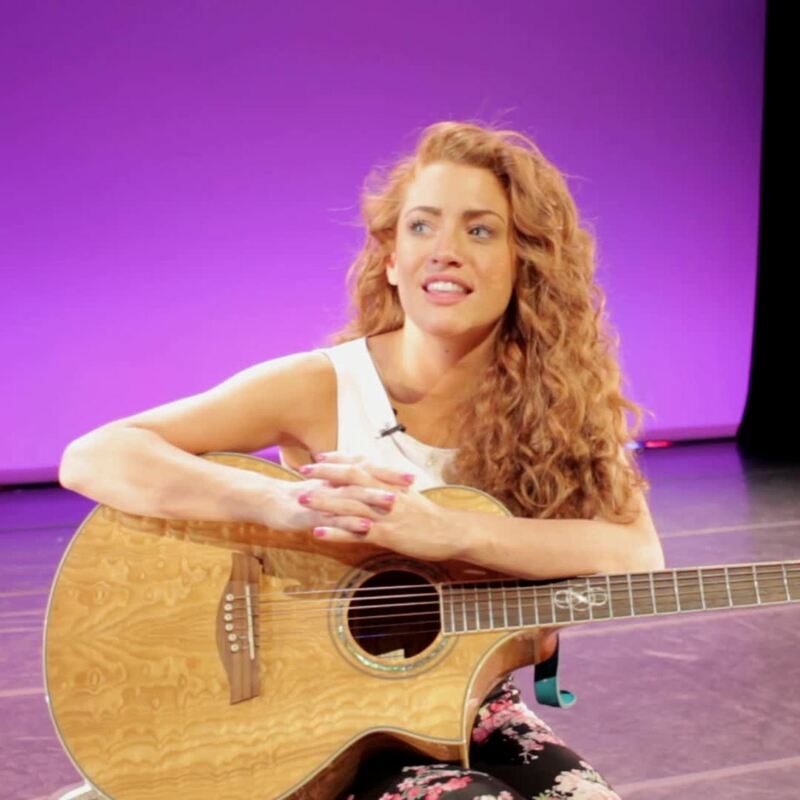 America's Got Talent star Madison Watkins will help you write, perform and promote your own songs. She'll also show you how to produce a live performance. The TV is off and JAM is on! Packs are the foundation of JAM courses. These challenges are designed to help kids achieve mastery by trying. Each pack is broken down into fun projects so you’ll never get stuck. JAM experts are passionate professionals who also happen to be awesome at inspiring kids. They share all their trade secrets and create videos exclusive to JAM so your kids can build their skills. Some experts share a hand-picked selection of their best pro videos, too. Hi, I'm Madison. I performed on The Voice and America’s Got Talent! I just released my first album and now I’m in LA pursuing my dream of being a pop star. No trolls. No jerks. No exceptions. We have a proven record of creating online learning experiences that are safe and inspiring for kids. We do this because safety and privacy are paramount, but also because we know that learning and creativity can't happen unless everyone feels fearless to be themselves. JAM posts are only viewable by other kids in the course and moderators who have passed rigorous background checks. No one over 18 allowed! Our moderators keep JAM safe for all kids, answer their questions, and provide encouragement and feedback. I honestly think this is an awesome online program for kids. The different projects push them to practice and discover new things on their own. I also love that kids get to post their results and learn from each other. My child enjoys the creativity that comes with self-directed work. Fun and engaging! After two weeks the kids are still really interested in making more engineering masterpieces. Their bedroom has become one enormous marble run using books, bits of LEGO, cushions, and random things from the kitchen. I can totally see this craze lasting for months! Thanks! My child loves it. She has learned to do exactly what she has set out to do. Thank you! My daughter ADORES her drawing course! She is so engaged and the feedback inspires her to try harder every time. My daughter loves the program and would like all her friends to enjoy it. It's such a fun and friendly site! My child is engaged and excited to learn. Well thought out and fun projects that teach my son applicable skills in engineering. It makes science accessible and not intimidating! JAM has interesting and fun projects that keep children engaged and wanting to learn more! My son was excited to see the things he would build in the engineering project and had fun getting items around the house to create his own project. What I really like is that JAM wants kids to share their failures. I think there is so much pressure in the rest of the world to be perfect but JAM's acceptance of failures helps kids to think through a problems and solve them. I believe that this kind of online, intrest-led learning is a valuable resource that gives kids what they need to thrive in the 21st century. The online environment is safe and minimizes imitation of social media communities. Curriculum is solid. My 11 year old daughter is really enjoying her JAM experience. She loves how easy it is to talk to other people and has plenty of time to complete her projects. She is quite able to participate independently and on her own timing. My 8 year old daughter loves the animation course. She rushes in now to complete her homework so she can start on her favorite subject. I think it is fabulous that you are offering courses the are of interest and relevance to kids in an accessible format. Absolutely love it!! My daughter loves JAM. She has so much fun with her art class. I think every kid should have that much fun learning something. My daughter is doing Drawing Bootcamp and the projects put a fun twist on creating. Before JAM she enjoyed drawing and creating, but wasn't always aware of what to do or create. JAM generates fun ideas for her that are easy to complete so she feels a sense of accomplishment. It's fun and easy to use, my 9 and 6 year old do it and there is always feedback and help on line. They said they love how many ideas they get from one concept and they still have freedom to work from there. Thanks for JAM! My son is a shy, mathematically minded kid who lit up like a firework when I logged him onto JAM. Can't wait to see where it leads him! We no longer fight about screen time. I'm confident that he is actually getting value out of the time he spends online and he loves it. Bravo! My kiddo is interested in moving forward without my having to make a suggestion. She's engaged in something she enjoys but in a new way. The TV is off and jam is on! My daughter jumped right in! So far, it has been a great start. My son loves it! He is so proud of what he has achieved. My son is so in love with his Drawing Bootcamp! He loves getting a new project and the feedback has made him blossom into a confident kid! We are excited to do more! My daughter loves Jam and the positive interaction. Our daughter loves the course and the platform. My son wants to do the LEGO course so now it's on his birthday list! It's been fun so far. Great experience for my son. There are not many opportunities to do things like this in our community, so I would recommend it to other creative kids. I chose JAM for the convenience of being able to use it wherever my child is. She is enjoying the topics and interactions immensely. My daughter loves the projects, is inspired by other kid's work and has been drawing loads since we joined. She also loves doing the videos. Before JAM there wasn't a safe platform for her to do this on. I am reassured by the lengths you go to to keep the kids safe. I want my kids to be productive and learn in the summer, not just waste time. I love that my 9 year old is loving the projects..I also love that he can be inspired and challenged by other kids! We are an autonomous education family, and we had been struggling to help our son fulfill his ambition of becoming an online Minecraft Show host - then along came JAM! He is so happy, switched on, and interested. Already his confidence has grown, his imagination is broadening, and he is even planning future shows! We love it! It's fun, it's very easy to follow, and kids can complete most projects on their own. Kids don't get overwhelmed, and there is also absolutely no pressure. I really appreciate the feedback my son gets on his projects and how he is positively challenged by someone outside of our home. I love that JAM is kept secure for kids. The positive feedback is great too. My daughter is having a lot of fun with the projects and I love it when she loves to learn. Thanks! My daughter is doing the Drawing Bootcamp. She loves the fact that she can work independently. I love the fact that I don't have to drive her from class to class. She enjoys sharing her work online with others in the class and see their reactions. It allows a lot of room for creativity. My son has been working really hard on his projects, and really enjoying himself. It's great anytime learning that's fun! The program is awesome! Fun and educational at the same time. So easy to figure out, flexible, and great customer service! I think it's a great way to make kids think outside the box, figuratively and literally. It's pushing my son to explore different ways of thinking. The projects are in a sweet spot between structure and openness. There's good support if needed, and I love the moderated community aspect. We are raising kids in a small town in a school system that revolves around sports which my child cares nothing about. This has been great for my daughter to help with her self confidence in her own art and uplifting others by commenting on their art. It is a fresh way to look at things. It has a lot more to do with the way my daughter thinks and with what she naturally does than all those textbooks and theory. This app is simple and easy to use. The engineering course inspires my son to build. My son is enjoying the projects and feels like he is getting some good ideas. Also, I'm always keen for my kids to take up something that is screen based but isn't just consuming other people's content. Thanks! It's a great, positive place for my daughter to connect with other artists....she is a wonderful artist but suffers from a neurological tic disorder. At JAM she can freely share and feel confident! JAM is teaching my son great skills: communication, presentation, and confidence. Seeing other kids like him is inspiring! Drawing Bootcamp is perfect for artist who prefer to draw what's in their mind without being told exactly what to draw and how to draw it. Their creativity is allowed to shine through. We homeschool. My kids can experience drawing instruction from home- no driving to a class, it can be completed in our own time, and it's affordable. Kids are enjoying it! I was a little surprised by the video-upload aspect, but it's motivating for the kids. We have been jumping around from activity to activity. It has gotten us doing a lot of "inventing" and tinkering and I'm pretty pleased! So far JAM has been great. It is a little scary for me to encourage children to post things on the internet. Letting my daughter post videos took me a little getting used to but I now realize JAM is a secure environment. My daughter loves it and I love that I get an email for each post. Thank you for the program! It's great. Especially in the summer. A parent can be involved as much as they want or can. Basically kids can do on their own. I recommended JAM to my homeschool community. We are loving the personality of the mentor and the feedback from the mod team. The projects are in achievable bites and my daughter is loving being connected to the community for inspiration. My daughter loves her course and I think it is the social aspect of filming and posting that really makes it more then just an "online" course. My daughter is thrilled with your illustrator program. Staff are very motivating! My daughter says it's really fun. She likes how it offers you projects she can do on her own. She also enjoys the feedback and seeing other's artwork. My daughter is being challenged, learning a lot, and having fun! My daughter has been loving the engineering projects. The tech tie-in is great for her. Love the free trial. My son is an academic outlier. We've been searching for a mentor for him. Finding someone with time, affordability, etc...is difficult. Jam is a fantastic solution to this! Just awesome! Minecraft course especially has sparked something in my daughter besides skill -- confidence. She is loving it!!! The work is all fun. There's a lot to do. You get to pick which project you do when. There's always the option of inspiration from other people because there are so many posts. The non-linear format with content tailored for different age groups is great. The partnership between students, mentors, parents is the kind of mix I really appreciate. Keep up the good work! It's a great fit for my kiddo! I have to work all day Sunday and before I know he was sitting around watching way too much screens and now he loves his Jam day! My child is very motivated to do the course and loves the projects. JAM is set up in a very tween-friendly manner. My daughter is really enjoying the course so far. She has ADHD and the feedback she receives keeps her interested and coming back. My daughter loves it and her drawings are so great! Love the lessons and the creativity it brings out! It is very fun and my kid enjoys it. My daughter loves the projects and JAM keeps her busy through the summer days. It's fun for a child to do, it's educational, and it occupies their time productively. My son, who has autism, is delighted by your course! Thank you. My daughter loves it and it's been a super safe way to introduce her to an online community. My son is spending way more time drawing plus he is learning new techniques! My daughter did the first 2 projects before she had to leave for camp and she was raving about it. I like that they can progress at their own speed and take the year to complete it. The feedback is great and the kids really feel involved. JAM has really good projects plus it's convenient to work on from home. We love the sharing, ideas, and opportunity to learn new things. With summer in full swing it's a great way to keep kids entertained! My daughter loves this and I feel like it is a great safe alternative to social media. She is learning skills and interacting in a positive way. Thanks so much! Great teaching! Very impressed by the way the moderators protect kids by emailing parents and by not allowing overly negative feedback from other kids. My daughter is loving the drawing course. It's keeping her motivated and excited to draw. I like JAM's setup, mission, and rules. It really helps me out as a single mom since I work late three days a week and am not always home to do creative and engaging activities with them. My daughter is loving the Drawing Bootcamp course. Her work shows improvement with each project she completes. I tell our friends who are considering art classes to check out JAM first. I think it creates such an amazing network of kids that share the same interest. JAM encourages collaboration and shows that trying and failing is OK! Kids can do JAM at home without parents having to drive everywhere. I like feedback in addition to the convenience. JAM is fantastic. I am the mother of a high-functioning autistic kid and I often struggle to find something that interests him and keeps him learning. Your website was just what I was looking for. The video lengths are perfect and the clear explanations works wonders with children on the autism spectrum! My grandkids and I loved building the first ramp. It's so good to put down the devices and pick up cardboard and create together!! Thanks. We don't lecture kids at JAM. Research shows that doing activities and receiving feedback is more effective than listening to a lecture – as much as 3x more effective! This is according to research conducted by Eric Mazur at Harvard; Nobel Prize winner Carl Wieman at Stanford; and Kelly Hogan at UNC Chapel Hill. Unlike most other online learning services where students work alone, at JAM, kids share each other's passion for what they're learning and are eager to give and receive feedback. Doing JAM projects will give your kid unique opportunities to try something new, with the added bonus of getting to meet others they can learn from and teach. The knowledge they gain on JAM will last for many years to come because it's rooted in a positive social experience. There’s no learning by cramming or memorization here. Instead, it's just a perfect circle of trying, failing, collaborating and growing. How much does JAM cost? You can try JAM for free! After your free trial you will start a subscription of your choice.The cost is equivalent to $15-25/month depending on the number of kids in your family and whether you want to be billed monthly or annually. ©2016-2019 littleBits Electronics Inc. All rights reserved. JAM is in no way affiliated with Minecraft™, Mojang, or Microsoft. LEGO® is a trademark of the LEGO® Group which does not sponsor, endorse or authorize this website or event.